I bet you were all waiting for these guys to come along. It was definitely one of the first foody bands I had thought of when coming up with the list. Yet another teenage discovery, the Smashing Pumpkins were definitely high on rotation back in the day. I don’t listen to them a lot anymore, but when I do I always feel reminiscent of those days. Just like getting on like a house on fire with an old friend you haven’t seen in years, the music just comes back to me. For today’s meal, I’ve smashed some pumpkins (sort of? the blender smashed them for me I suppose..) into a creamy delicious risotto. This is actually the best risotto I’ve ever made. I think the taste is great, but I also really just cooked it to perfection – I have a habit of cooking risottos on high heat to try and get them done quickly. This time I was patient, cooked it slowly, and reaped the rewards. First up, you’re going to want to roast your pumpkin. Preheat your oven to 200C. Remove all bits of skin and seeds, and dice pumpkin flesh. Place in a baking dish, drizzle with oil and sprinkle with some salt and pepper. Chuck in two garlic cloves in their skins as well, just because how can you roast a vegetable without adding some garlic? Exactly, you can’t. Roast for about 25-30 mins until tender. When the pumpkin is about half done, heat up 1 Tbsp coconut oil in a large pot over medium-high heat. Add onion and half of your leek, and saute for five or so minutes until the onion is translucent. Add garlic and saute for another minute. While this is happening, bring your stock to boil in another pot, then turn down to a mild simmer. Add rice to onion mix and dry fry for about a minute. Add white wine, and cook for about 2 or 3 minutes, until most of the wine has been absorbed. From here, start adding stock. I like to use a ladle and scoop it in one ladle-full at a time. Your rice should always be JUST covered by stock. Turn heat down to medium-low, so that it is never more than a slow simmer. DO NOT walk away from your risotto…this takes some time, but it’s best to be patient. Continue to add stock as needed to keep liquid above rice, then wait for it to absorb. Stir your risotto frequently so that it doesn’t stick to the bottom. When your pumpkin is done, remove from oven and allow to cool slightly. Place in a blender, and squeeze your little garlic cloves out of their skins and into the blender too. Blend until smooth and set aside. Once all your stock has been added, check texture of rice. If it is al dente – perfect! If it still has a little way to go, you may need to continue adding liquid until it reaches the desired texture. Add remaining leek, sage leaves, nutritional yeast and chili flakes and stir to combine. Add salt and pepper to taste. Pour pumpkin puree in and mix well. For the crispy sage – heat 2 Tbsp coconut oil in a small pot until very hot. Have some paper towel on a plate ready next to you. One at a time, drop your sage leaves into the oil. Have a fork ready to scoop them out after about 10 seconds, when they become crispy. Follow this process with each sage leaf, then sprinkle the lot of them with a bit of crushed sea salt. 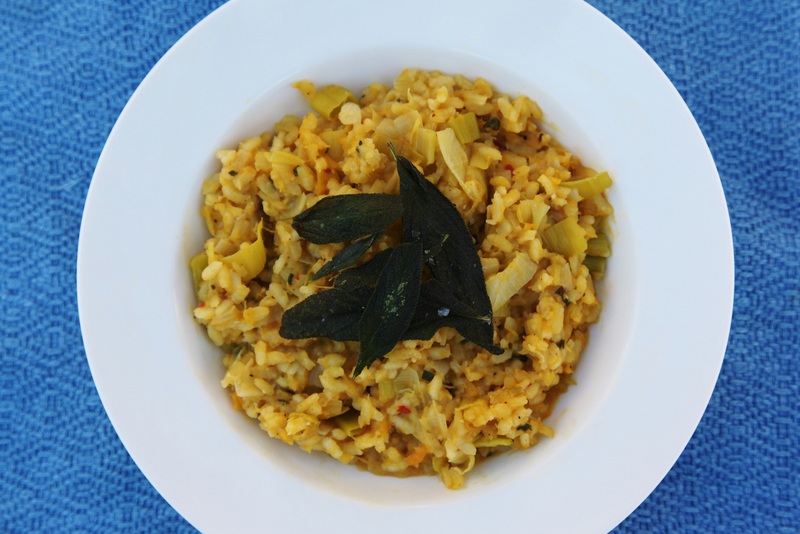 Remove risotto from heat, serve and garnish with sage leaves. Oh I have never watched this film clip but I am so glad you shared it – I had one of their albums that was loaned and never returned – and I haven’t seen those films but I have seen Hugo (have you seen it) which references them. My favourite smashing pumpkins song is 1979 – always makes me feel melancholy. 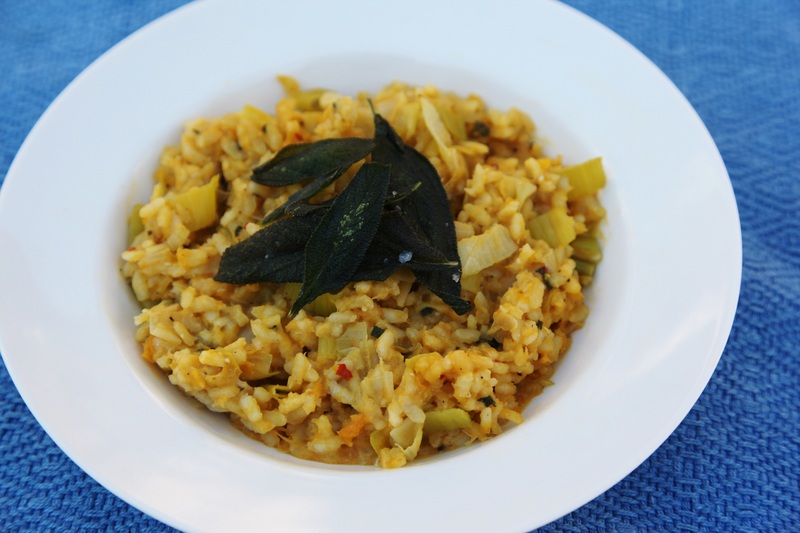 And pumpkin risotto is something I love but haven’t made for ages – should try it with some nooch some time. 1. Your blog looks really beautiful! 2. This is the best Vegan MoFo theme! Ooh I love butternut risotto! Yum!